Spaces By Jacflash is an internationally recognized interior design firm with expertise in residential, commercial, hospitality and retail projects. Based in Toronto, Spaces by Jacflash was established in 2014 by Jaclyn Genovese, who has become a prominent expert in the industry. Spaces By Jacflash combines extraordinary talent to produce spaces described as “cutting edge” and “timeless”. Spaces by Jacflash revamped a once dark, dated and empty condo into a modernly chic and functional living space. Working on a budget, we mixed new items with the client’s existing pieces and added nature, metallic details, and lighting to unify the space. Our favourite element is the white brick peel-and-stick wallpaper made complete with acrylic display shelving. The result was a stylish, serene, and purposeful home! Spaces by Jacflash designed this open-concept office space to foster comfort, productivity, and functionality for its occupants. We built an enclosed but inviting office for the CEO, custom desks and workstations for the staff, a homey living area and stocked kitchenette incorporating blacks, golds, tan accents, creative lighting fixtures and greenery throughout. Spaces by Jacflash used black, gold, and greenery to bring an elegant, modern, and crisp feel to this Liberty Village condo. By purchasing some key pieces and keeping some of the client’s existing furniture, we were able to keep our budget low without losing out on quality. We used accents of gold and plants to accessorize and create a unified space. Our favourite touch is the black, custom geometric feature wall that we custom-built in the office. 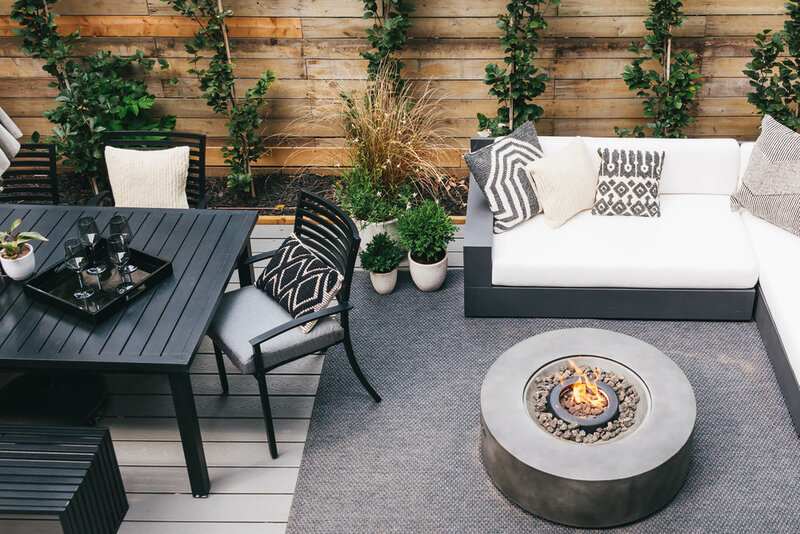 Spaces by Jacflash re-vamped this backyard into a luxurious, functional oasis. We paired inexpensive and higher-end pieces together and completed the look with a warm fire-pit, a beautiful custom wood shell installation, and potted plants throughout the space. Spaces by Jacflash updated this outdated kitchen and dining area to meet our client’s appreciation for tradition while putting a modern spin on the design. 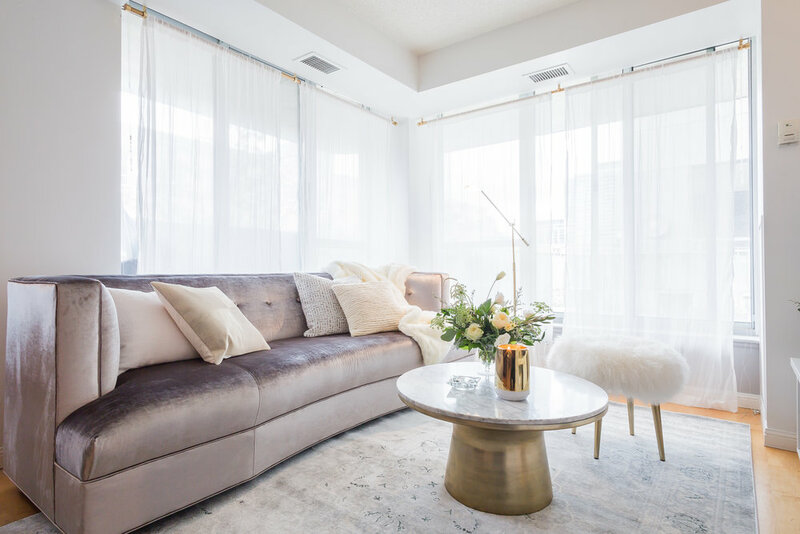 Spaces by Jacflash transformed this small townhouse into an airy oasis for Toronto’s own Blake Carter, host of 93-5 The Move. We mixed vintage and modern pieces together, giving an unexpected flare to the space. We added personal items and kept functionality at the forefront to make our client feel at home. Spaces by Jacflash designed an eclectic pop-up in the iconic Queen West New Era building. In just a few weeks, we built walls, ceilings, and floors, sanded, painted, and upholstered custom furniture in the HEXO logo colours. 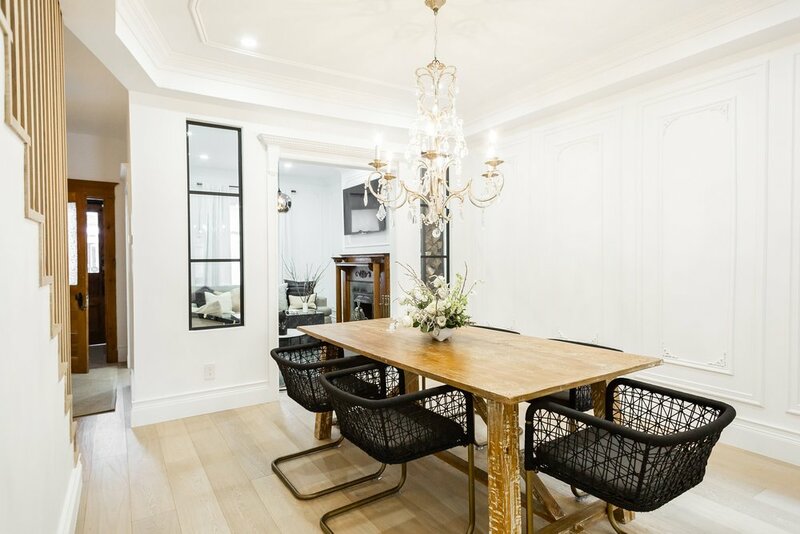 Spaces by Jacflash combined textures and metals to create a functional, traditional, yet chic living/dining area for this Toronto condo. Check out our unique storage solution for children’s toys! Spaces by Jacflash amped up a quirky condo into a more sophisticated and put-together living space. We found inspiration from eclectic, traditional styles. Every piece we chose serves more than one purpose and can live in her home for years. Spaces by Jacflash transformed this once-claustrophobic living and dining room into an open and airy, gorgeous space. We removed a dated plate rail that had made the the ceilings feel very low. We also removed the stair wall, exposed the brick and hid a bulkhead by transforming it into a feature to accentuate our new crown moulding. Spaces by Jacflash designed The Remy Martin Locker Room for Get Fresh Company during the NBA's All Star Weekend in Los Angeles. This space was created for guests to come get groomed, get changed and get right for the weekend's festivities. 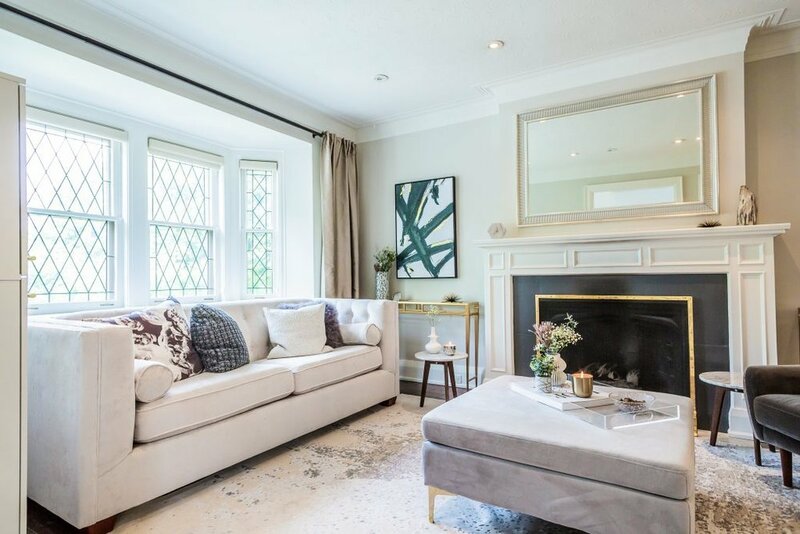 This century old Toronto townhouse faced a lot of typical older home issues such as little natural light, narrow layouts, separated rooms and small bathrooms. 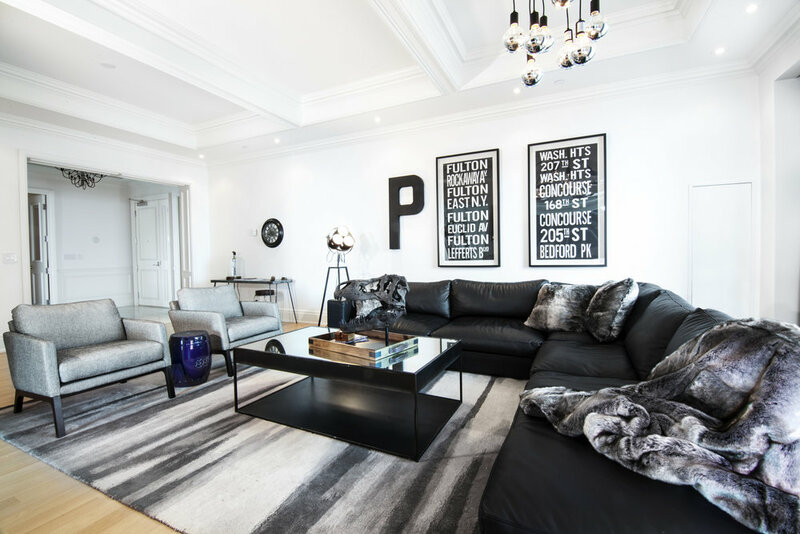 Spaces by Jacflash created a glamorously chic space for this client that feels both sophisticated and inviting. The key with condo living is to make every furniture piece functional. Spaces by Jacflash gave a major makeover to a small kitchen that was stuck in the 90s, with maple cabinets, laminate counters, and a dusty rose ceramic tile backsplash. We transformed it into an open, airy space with a 'modern-meets-retro' vibe to connect with the concept of the previously done living room. Spaces by Jacflash is super excited to reveal youtuber Jus Reign’s Downtown Toronto condo. The theme that Jus Reign had requested was “reignforest”. Spaces by Jacflash was thrilled to design the pop-up for the new Puma x Get Fresh collaboration shoe. We used design elements from the shoes to create faux “rooms” in the space, and accented with 90s-era pieces like shoes on a wire, cassette tapes, license plates, and an old TV. Spaces by Jacflash has transformed a once dated Toronto loft into a contemporary, elegantly eclectic bedroom. By combining a grey colour story, endless textures, tailored elegance and ravishing features, this room establishes the perfect marriage between masculinity and glamour. Spaces by Jacflash has created many exclusive pieces for Toronto's favorite men's boutique, on Queen St. West, Get Fresh Co. From the custom cut out bench, to the back lit the shoe and display shelves, Spaces by Jacflash has helped to bring this staple streetwear shop to life. We livened up the space by using organic elements including a lush, bird of paradise plant, a succulent, an elegant orchid and roses. We also incorporated stacked wood into a bookshelf under a monochromatic library of books. 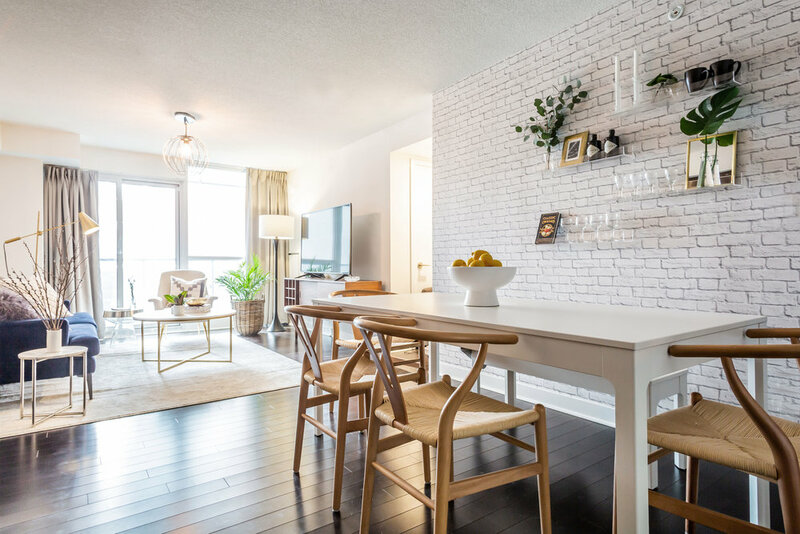 Spaces by Jacflash inexpensively spruced up this client's condo by using several of his existing furniture pieces but adding more organic touches to create this memorable and refreshing space.